This motion-activated mirror is home to a spooky fortune teller who isn't shy about sharing delightfully frightful predictions. Dare to hear what's in store for you? Activate the mirror's motion sensor by standing in front of it to awaken the spirit within. I predict something dark in your future. I think it must be, yes it is, chocolate. Listen, look, and be very wary. For I've seen what's out there and oh, it's scary. A word of wisdom for your future. Seek more candy. 10.5" W x 16" H x 2" D.
Greet trick-or-treaters with a surprise this Halloween—a pumpkin that comes to life! When kids activate its motion sensor, the pumpkin will light up in a changing jack-o'-lantern expression as it says fun Halloween phrases. Happy Halloween! I hope it's a scream! Oh, ever since the carving, I just have this empty feeling inside. Oh, it's you again. How hauntingly familiar. You look horrible. I like it. 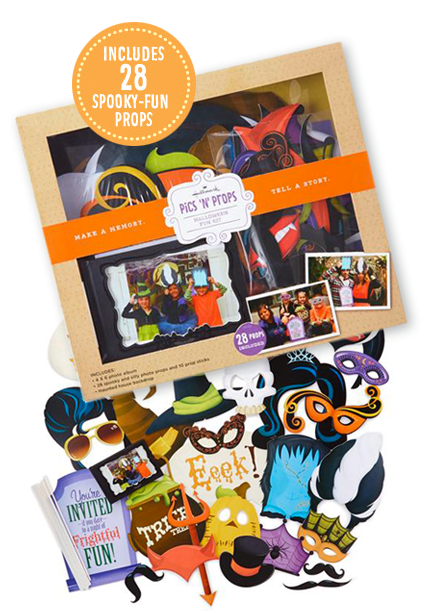 Add life into any Halloween bash with this kit of scary-fun photo props. Hang up the haunted house backdrop included in the kit and let guests take turns posing in front of it. After the party has died down, you’ll have a blast resurrecting favourite memories by adding them to the coordinating photo album, included in the kit. for everyone from kids to adults. 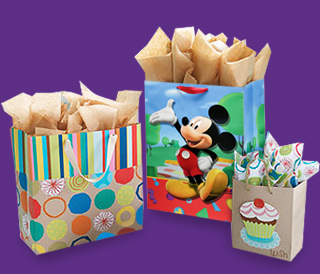 birthday parties on your list? Get the bags you need at your Hallmark Gold Crown store for $1 each with any 3 card purchase**. Remember you can also purchase 5 cards for $15. * Offer only valid on 8HGN5103, 8MJN1014 and 8HGN5114. Offer valid while quantities last or until 10/31/2013 at participating Hallmark Gold Crown retailers across Canada, excluding Quebec.